A desktop appraisal is just how it sounds, an appraisal done from the appraisers office. Which means there is no physical inspection of the subject property. Which means the condition of the property, and the characteristics of the property, are assumed to be accurate based on County records, MLS listings, or the homeowners description. A desktop appraisal still provides comparable sales and gives an appraised value of the home. 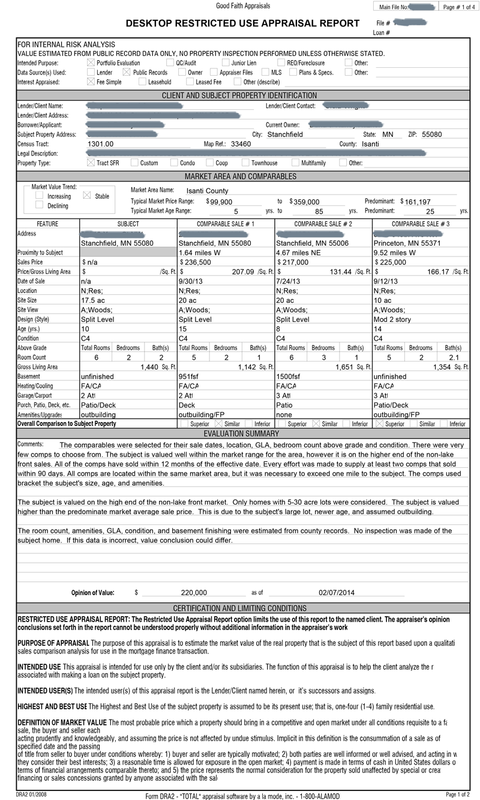 If the descriptions given to the appraiser are not accurate, your value is probably not accurate. These products cost significantly less than a full appraisal, and have many useful purposes. Desktop appraisals work very well when the subject property is similar to many other homes in the area. For unique properties, or homes on large acreages with outbuildings, or lakefront, etc., this product is not advisable. A desktop appraisal is similar to another product that Good Faith Appraisals offers called a market analysis. A desktop appraisal is more precise than a market analysis. A desktop appraisal will compare the subject property to specific comparable sales. A market analysis will give a value range for common homes in a given neighborhood. For example: in a desktop appraisal you may get an appraisal back on a three bedroom two bathroom, split-level home of $175,000. In a market analysis of the exact same subject property, you would get a range of similar sales that could be, for example, $160,000-$195,000. Both a desktop appraisal and a market analysis are quality appraisal product's that have different purposes. A market analysis is less expensive to purchase than a desktop appraisal, but it does not give you an exact appraised value.